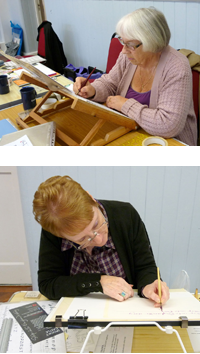 If you would like to give calligraphy a try, why not come along to one of our Study Days. Study Days are informal sessions where members work on their own projects, or just practise lettering in a friendly and supportive atmosphere. All basic equipment can be provided to beginners for the first Study sessions. Complete beginners will be given guidance on the basic skills of calligraphy from members, who will be on hand to support and help throughout the session. Handouts of scripts are provided which will enable students to practice in their own time and gain confidence to attend, when they are ready, a 10-4pm tutored Workshop as listed in the PROGRAMME PAGE. For more information please e-mail enquiries@lingfieldscribes.co.uk.